Tomorrow is our daughter's birthday, so I needed to get her card made so Jon could stop in the morning (since I am too late to mail it) and deliver it. I started with a 6.5 x5.5 card. A piece 6.25x 5.25 coordinating card stock was punched with the Martha Stewart Deco Fan punch and then the new Mariposa paper was added. This flower is from the JustRite Beautiful Blossoms Stamp set and was colored with the Copic Markers. 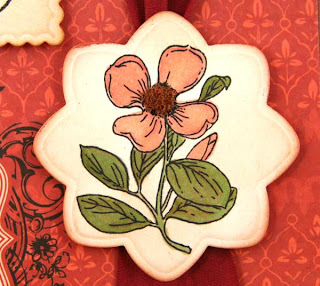 Flower Soft Nutty Brown was added to the center for texture and cut out with the Dahlia Nestie . to blend with the flower. The Butterfly and other patterns are part of the new Mariposa paper. Isn't it beautiful? this weekend is the Copic class and I have to get ready for the girls to arrive, so no time to change it now. What are your thoughts on this? Wow Joan, this is so beautiful!! I love how you used the Dahlia nestie for the flower. Those butterflies are beautiful too. What a gorgeous card - your daughter is going to love it. Joan this card is beautiful. The paper is wonderful. I also love the Martha Stewart Punch. Absolutely gorgeous!! So much to look at and admire! She's going to love it!! Hi Joan, what a beautiful card! the red and white card stocks? Either way, it would be sensational. Gorgeous card...love it and so will your daughter..the color is just beautiful. Thank you for sharing! Wow!!! Joan is is incredible! Your coloring is amazing!! Joan, This is stunning! love the gorgeous paper! I think I would leave the cream colored paper as it shows off the beautiful decorative edge! Hi Joan, Happy Birthday to your daughter. Your card is amazing. I love all of it. The color and detail is awesome. I absolutely love it just the way it is, and I'm sure your daughter is going to love it too. I hope she has a wonderful birthday and I hope you get to share it with her! Gorgeous card Joan! I've got to get some of this paper soon! Tell your daughter I said "Happy Birthday"! Absolutely stunning Joan, Lori will love it! 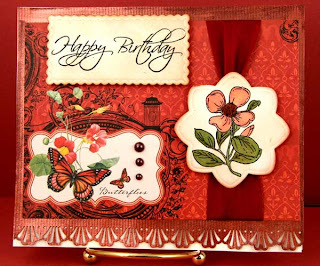 Gorgeous papers, gorgeous card!